Lene Kaaberbøl and Agnete Friis are the Danish duo behind the Nina Borg series. Friis is a journalist by training, while Kaaberbøl has been a professional writer since the age of 15, with more than 2 million books sold worldwide. Their first collaboration, The Boy in the Suitcase, was a New York Times and USA Today bestseller, has been translated into 30 languages, and has sold half a million copies worldwide. They are also the authors of two other Nina Borg novels in addition to The Boy in the Suitcase: Invisible Murder and Death of a Nightingale. "If this indeed is the finale, the series will end on a high-flying note . . . We have four fine books in a series that demands to be read and re-read." "Seldom do readers get to know a character who so wholeheartedly—and blindly—throws herself into the role of White Knight, constantly battling to do right, unceasing in her fight to give a voice to the powerless. Yes, the stories are excellent, but Nina is the reason I recommend this series." "Chilling and startling . . . A very satisfying conclusion to a gripping series." "[Nina] joins the sisterhood of run-amok heroines like Homeland's Carrie Mathison and Lisbeth Salander of The Girl with the Dragon Tattoo. Nina doesn't just have a bee in her bonnet—she has a whole hive. And it's buzzing away in her latest adventure, Death of a Nightingale, an elaborately plotted page-turner that flits from today's liberal-minded Denmark and mobbed-up Ukraine to the starvation-racked Soviet Union of the Stalinist '30s." "Feminist outrage fuels the politically pointed novels of the Danish writing partners Lene Kaaberbøl and Agnete Friis . . . Nina is all heart and her efforts to bring justice to women like Natasha are heroic." "A moving story . 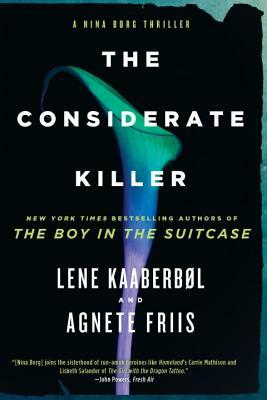 . . [Kaaberbøl and Friis] tell a socially conscious—and, at times, critical—tale about immigration issues that apply both to Denmark and the U.S. without sacrificing the urgency of the best thrillers."